This was the cake on our Thanksgiving Dessert Table...next to the Pecan Pie and Pumpkin Pie. And our guests truly loved the balance of flavors, textures and deliciousness. I was happy to bake this for one of my favorite holidays. While the Cream Cheese Frosting doesn't look perfect on the cake, I can live with it. 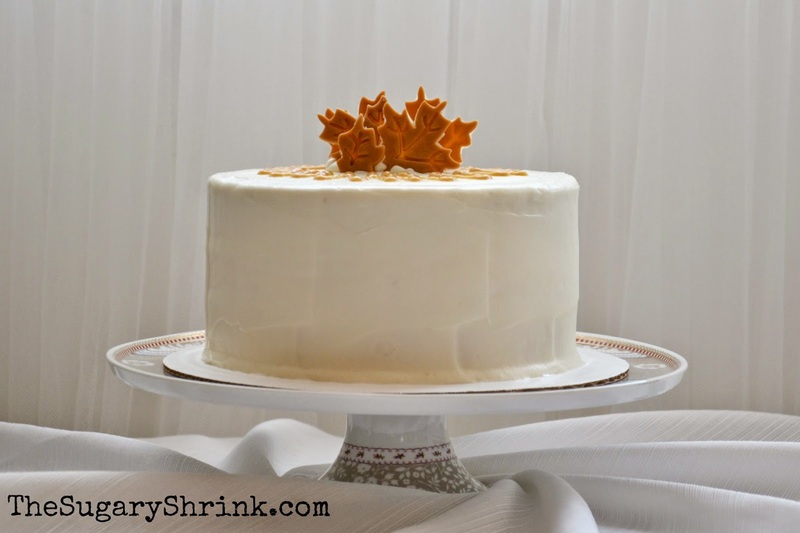 When I described this Butterscotch Layer Cake to our international friends, I realized that Butterscotch isn't as familiar a flavor as I thought. For sure, it's not a traditional layer cake, but it's quite popular as a pie or pudding. Butterscotch sponge is very light in flavor and not overly sweet - which is why it pairs wonderfully with the Cheesecake. 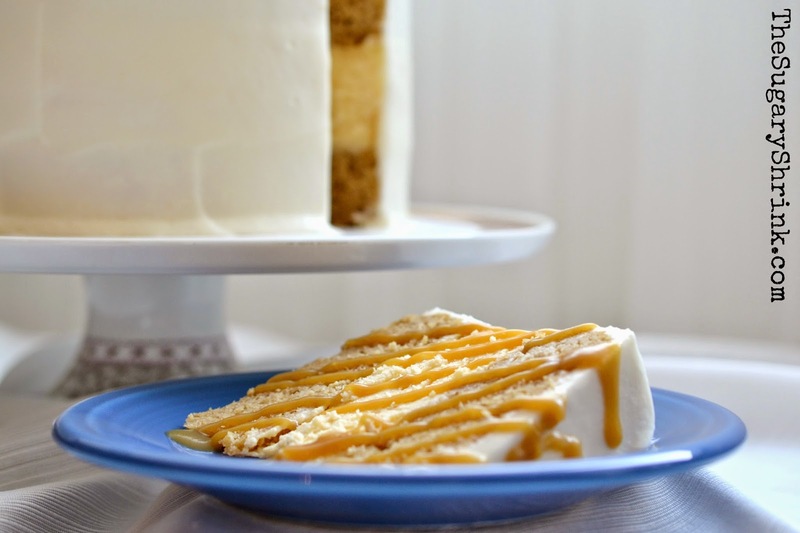 Topping each slice with Butterscotch Sauce is the perfect complement. Consider trying this delightful and unexpected cake for an upcoming holiday party. I originally baked Butterscotch Cupcakes testing these recipes, read about that here. This is how the cake went together. Again, when I build a cake with a cheesecake, I don't typically add a buttercream filling. However, I love adding a fruit jam, puree, curd, or pie filling. A little zig-zag of Butterscotch Sauce is a lovely finishing touch. Also, I couldn't decide between two or five Caramel Leaves. The slice picture still makes me nervous. If the cake is especially lovely, I hesitate to cut it. But, cake has a shelf life and is meant to be eaten! Also, it was Thanksgiving. And grateful I am...for my life partner and our kids. And, sobriety - I'm definitely grateful for a life the offers wonderful opportunities and moments of pure joy.